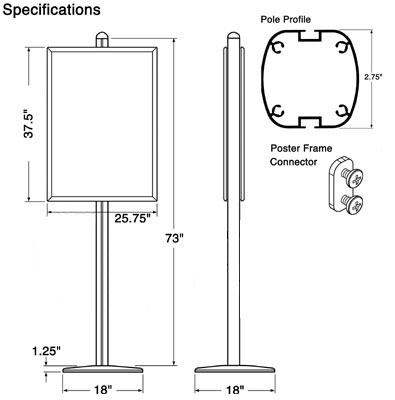 A retail poster display features an adjustable 24" x 36" snap open frame! 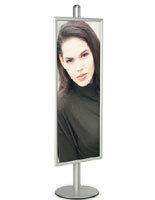 Adjustable Snap Open Frame - 24" x 36"
A retail display must have 3 important qualities. It should be attractive, functional and sturdy. 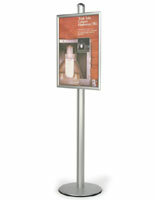 This 24" x 36" FORTE retail poster display fits all those qualities and more. Attractive: This retail poster display is manufactured from sleek brushed aluminum that is bound to enhance any environment. 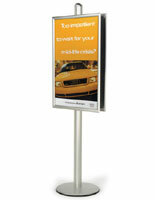 The slim poster frames allow for maximum graphics viewing with minimum bulk. Functional: Channels on either side of the base pole allow you to adjust the frame to any height you want. 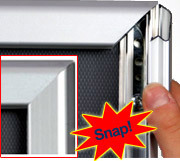 The snap open frames let you change your graphics without having to move the frame or take it down. Sturdy: This top quality retail poster display was made to last and last. 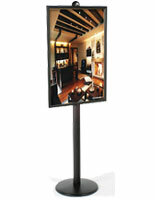 The pole and base are bottom heavy weighing 25 lbs so that your display will not fall over. A rubber coating around the rim of the base keeps scratches off both your floor and the display's bottom. Also included with the frame is a clear lens to protect your graphics and keep the poster laying flat in the frame. This retail poster display in one that will last you for years. Note: This display is only designed for indoors use.